“Rejoice and be glad!” is what Jesus said on the Sermon on the Mount. 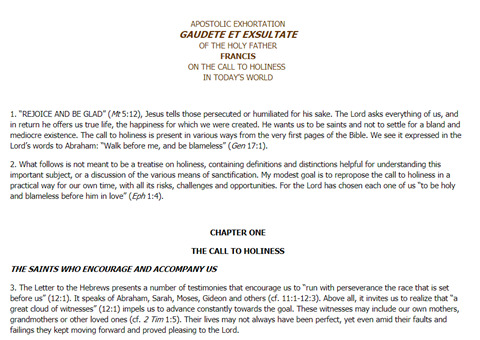 It’s also the title of Pope Francis’ new apostolic exhortation on holiness in everyday life. Why should we “rejoice and be glad”? Because God, as Francis reminds us, calls us all to be saints. But how can we respond to that call? Well, here are five takeaways from Francis’ new and very practical exhortation. Pope Francis offers us many examples of holy lives throughout this document: St. Thérèse of Lisieux, the French Carmelite who found holiness in doing small tasks; St. Ignatius of Loyola, the Jesuit founder who sought to find God in all things; St. Philip Neri, the founder of the Oratorians who was renowned for his sense of humor. You do not need to be a bishop, a priest or a member of a religious order to be holy. Everyone is called to be a saint, as the Second Vatican Council reminded us—a mother or a father, a student or an attorney, a teacher or a janitor. “Saints next door,” Francis calls them. All we need to do is to “live our lives in love” and “bear witness” to God in all we do. That also doesn’t have to mean big, dramatic actions. Francis offers examples of everyday sanctity, like a loving parent raising a child; as well as “small gestures” and sacrifices that one can make, like deciding not to pass on gossip. If you can see your own life as a “mission,” then you soon realize that you can simply be loving and kind to move towards holiness. You also do not have to be “swooning in mystic rapture” to be a saint or walking around with “lowered eyes.” Nor do you have to withdraw from other people. On the other hand, you do not want to be caught up in the “rat race” of rushing from one thing to another. A balance between action and contemplation is essential. Pope Francis may send people racing to either dictionaries or their theology textbooks when asks us to avoid two dangers in the spiritual life. The first is Gnosticism, from the Greek word gnosis, to know. Gnosticism is the old heresy that says that what matters most is what you know. No need to be charitable or do good works. All you need is the correct intellectual approach. Today Gnosticism tempts people to think that they can make the faith “entirely comprehensible” and leads them to want to force others to adopt their way of thinking. “When somebody has an answer for every question,” says Francis, “it’s a sign that they are not on the right path.” In other words, being a know-it-all is not going to save you. The second thing to avoid is Pelagianism, named for Pelagius, the fifth-century theologian associated with this idea. Pelagianism says that we can take care of our salvation through our own efforts. Pelagians trust in their own powers, don’t feel like they need God’s grace and act superior to others because they observe certain rules. Today’s Pelagians often have, the pope says, “an obsession with the law, an absorption with social and political advantages, punctilious concern for the church’s liturgy, doctrine and prestige.” It’s a real danger to holiness because it robs us of humility, sets us over others, and leaves little room for grace. 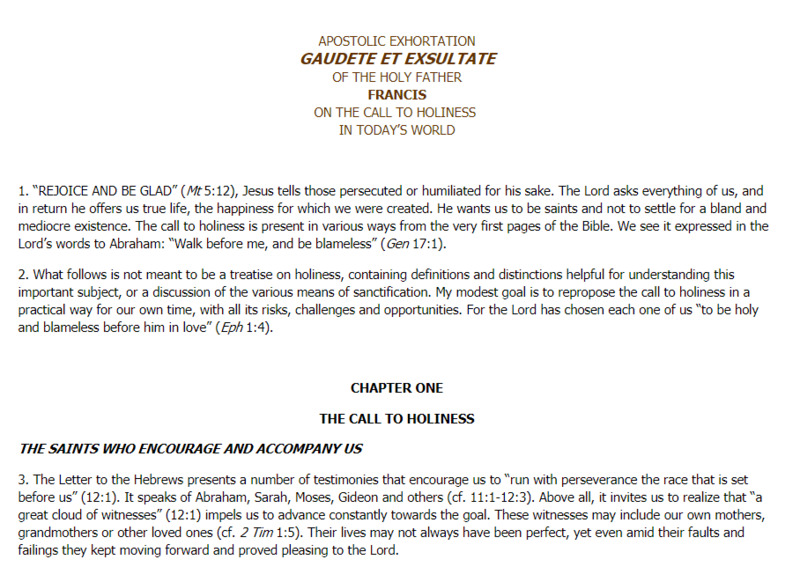 Gaudete et Exsulatate is filled with Pope Francis’ trademark practical advice for living a life of holiness. For example, don’t gossip, stop judging and, most important, stop being cruel. To be holy, be kind. As you might guess from the document’s title, the Beatitudes, Jesus’ list of “blessed ares,” are central to this exhortation. The Beatitudes are not only what Jesus means by holiness, they are also a portrait of Our Lord himself. So we’re called to be poor in spirit, meek, peacemakers, to hunger and thirst for righteousness, and so on.